Left unchecked, tomato pests can inflict lots of damage to your tomato plants and even destroy them. But there’s good news. If you keep a close watch, you can identify pests as soon as they begin their dirty work and treat them before things get out of hand. Monitor tomato plants daily. Check leaves, stems and fruit for these symptoms that come from nasty critters on the prowl. Find out more about each pest and how to control it when you click on its link. Here’s an overview of the most common treatment methods for tomato pests. Choose the best treatment prescribed for each one. Get more information when you click on links above for specific pests. Spray with water. Use a hose to spray plants with a strong jet water stream. This causes insects (especially smaller varieties) to dislodge and move on. Spray plants several days in a row to eradicate as many generations of fast-multiplying insects as possible. Handpick insects. Remove insects by hand. Use gloves. Destroy pests after removal by drowning them in a bucket of soapy water or crushing them with your foot. While handpicking is not practical for very small pests, it works well with larger ones like the tomato hornworm and the tobacco hornworm. Apply insecticidal soap. Potassium salts in insecticidal soap’s fatty acids remove an insect’s protective waxes and cause disruption of insect cell membranes. They are effective when applied directly to the insect on the plant. Mix with water to produce a 2-3% dilution. 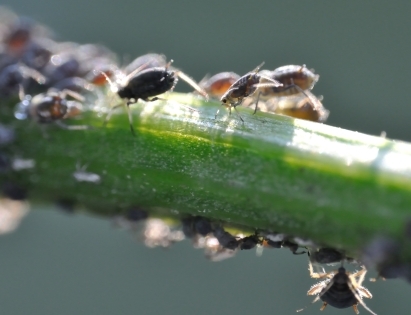 One advantage of using insecticidal soap is less residual effects on other organisms. Moreover, insecticidal soaps are organic. One disadvantage is that certain plants may be sensitive to soaps, causing leaf burn. Insecticidal soaps are particularly effective on smaller pests such as aphids, pysillids, and spider mites. Apply horticultural oils. Plant- or petroleum-based oils are combined with water to produce horticultural sprays. Neem oil, for instance, is derived from seed extracts of the neem plant. Oil-based sprays block an insect’s air holes, interfere with an insect’s metabolism, disrupt feeding, or inhibit insect growth. Like insecticidal soaps, horticultural oils can cause plant injury if not properly diluted. Apply insecticides. If pests continue to attack plants after you’ve tried other treatment methods, you may need to resort to insecticides like Sevin (available in granules , concentrate , or ready to use ) or Eight (Permethrin) - available in dust , concentrate , and ready to spray . But keep in mind that by doing so, you may kill helpful insects. Follow product instructions. Treat for 2-4 weeks with a garden sprayer. 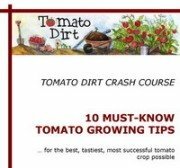 Do You Have a Problem From Tomato Pests? Do you have a problem with your tomatoes from a tomato pest? Describe your plant (if possible the variety, the soil, the weather) and the its symptoms. If you've seen the pest, describe it as best you can. Enter a title, such as "Big fat green worms are eating my tomatoes. What are they?" What pests are eating my cherry tomatoes? I need a good vole deterrent! How do I keep stink bugs or (or leaf-footed bugs) off my tomatoes? Tomato Pests: Not from a deer - but what is this thing?